This co-ownership is for a single purpose - to separate the ownership of property between two or more owners for legal purposes. Use it either to separate out your joint interest or to set down different ownership shares, or both. Examples of situations in which you might use it include: if you are divorced or considering separation, or if you have bought a property with friends. In law, it converts a joint tenancy to a tenancy-in-common. It does not provide a management framework. See below for alternative documents covering management and other arrangements. This agreement “severs” a joint tenancy, and sets out how the sale proceeds of real property will be split between the owners. You may be married or in a relationship, and want to know that if you separate, when the property is sold you will each get out what you have put in. You may be a couple, group of friends, brother and sister, or parent and child, buying a house together to get on the property ladder. You may be buying for business purposes and simply not want the Land Registry to show your proportionate shares. This is a simple agreement for owner occupiers. It is not suitable as the basis of a property venture for profit. In law, the relationship of co-owners of property is either as “beneficial joint tenants” or as “tenants in common”. The term “tenant” has no connection with a tenant under a lease. Under either sort of tenancy, a joint owner can insist on a sale. You own the property equally. When you sell, the proceeds will be divided equally, even if one of you has contributed more in the meantime. If one of you dies, the other(s) automatically get his share - even if you are divorced or separated, and regardless of what you write in your will. This agreement serves two purposes. First it “severs the joint tenancy”, so that each owner owns an identifiable share. This could be 50:50, or it could be any other ratio. That is legally valid, but will not change pre-existing obligations, for example, who is responsible for repaying the mortgage. Secondly, it sets out the arrangements for division of the proceeds of sale of the property. Depending on the circumstances, that will be legally binding between the owners, but may not be binding against a third party, like a trustee in bankruptcy. The agreement enables you to choose the ownership proportions or make arrangements for changing the proportions. For example, you may want a gradual increase in the share of one owner who is paying off a mortgage or parent-lender. Your shares in the property are separate in law, so that a creditor of one cannot take the share of the other too. When you sell, the net proceeds are divided in the shares you have agreed. If one of you should die, that person’s share will pass according to his will or intestacy. 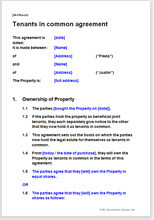 Joint ownership agreement: residential property to record the joint ownership of a single residential property. Where all the owners occupy the property at the same time. Cohabitation (living together) agreement sets out living arrangements, such as responsibility for bills. Depending on your relationship, you may also want to consider a pre-nuptial agreement or a separation agreement to set out ownership of other assets. This document was written by a solicitor for Net Lawman. It complies with current Irish law. "I will certainly be advertising your company to other business colleagues. The lease was like picking up an old favourite novel and understanding everything from the first turn of the page. So easy to read and complete, what a joy and your site was recommended to me by another colleague. Hope this brings a smile to your face knowing you are making business life easy for people and furthermore the price was just as pleasing. "Very comprehensive and easy to read documents. Highly recommend. " "...Yes very useful. I understand the terminology etc as I've seen a fair few legal docs before. Notes are very helpful. Gives me some base insight without the expense of a solicitor! "